Labrador Records has been the greatest last.fm supporter and endorser since the service debuted its artist/label-uploaded and managed streaming and downloadable audio system. You can literally at least stream like, the whole Labrador catalog, and download quite a few tunes as well. Well, maybe not all of it, but a lot a lot! 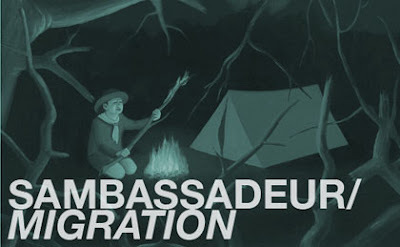 Sambassadeur (MySpace) (one of my/everyone's favorite Labrador group) now has their forthcoming LP, Migration up for streaming on last.fm ... listen to it here! The record doesn't come out for another eight days, and that's in Sweden, so I don't even know when us Americans will be able to get our hands on a hard copy ... so enjoy the LP online for now!